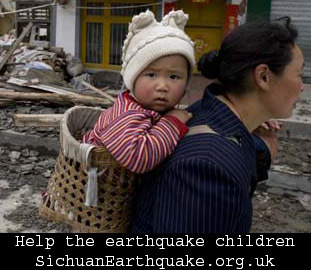 The 7.9 magnitude tremor, which was focused in China’s Sichuan Province, is estimated to have killed at least 68,000 people - and that toll is expected to rise dramatically as rescue teams reach the most affected areas. In cities near the earthquake’s epicentre, over 26,000 people are buried under the rubble of collapsed buildings. One county is reporting that more than 80 percent of buildings have been destroyed. The Chinese government estimates that as many as 5 million homes may have been destroyed. This entry was posted on Tuesday, June 3rd, 2008 at 12:36 pm	and is filed under Fundraising Events. You can follow any responses to this entry through the RSS 2.0 feed. You can leave a response, or trackback from your own site. A lot of thanks for your own hard work on this website. Gloria delights in carrying out research and it’s really obvious why. I notice all about the lively way you convey advantageous items through the blog and cause response from visitors about this concern while our favorite child has always been becoming educated a lot. Take pleasure in the rest of the year. Your carrying out a splendid job. I and also my pals ended up reading through the nice key points on the blog while unexpectedly got a horrible suspicion I never expressed respect to the web site owner for those secrets. Most of the ladies are actually consequently warmed to study them and already have quite simply been having fun with these things. Thank you for actually being indeed accommodating as well as for using some cool themes most people are really eager to be informed on. My sincere regret for not expressing appreciation to you earlier.